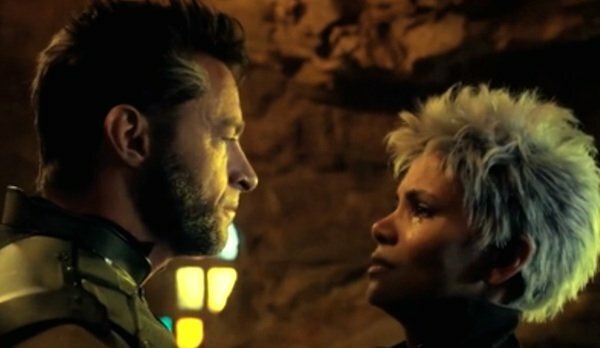 Wait, Why Are Wolverine And Storm Making Out In This X-Men Footage? Of course it’s always good to see two of the best looking people in the world kissing, but for X-Men aficionados it’s doubly delightful to see Jackman’s Logan and Berry’s Ororo Munroe doing so. Fans have long pined to see the duo together, and not only have they been the subject of many websites that are devoted to their pairing up but dozens upon dozens of pieces of fan fiction have also been written in their honor. Meanwhile the cover of a 2012 issue of Wolverine and the X-Men even saw the two of them passionately kissing. So what leads up to the beloved characters’ first cinematic smooch? Well, not too much really. After Ellen Page’s Kitty Pryde/Shadowcat explains that the past and present will co-exist until Wolverine finally returns from the 70s, which is when whatever he’s changed will take effect and irreversibly change the future forever, it becomes clear that there has been something romantically brewing between Storm and Wolverine since we last saw them. Logan is then told that he will be the "only one that will remember the war" which is when Ororo tearfully chimes in and declares, "I won’t have to miss you." The pair are then left alone and Wolverine whacks an almighty kiss onto Storm, tells her "I got this," but then looks dejected after she leaves. It’s pretty clear why the sequence was edited out of the final film. Not only did it make Wolverine’s quest start off on a downer, but at that point in the film there was no need to delay the action from reaching the past any further, especially for a kiss that most viewers would have been surprised to witness. Plus, as Apocalypse will revolve around the younger incarnations of the superheroes, there will be no additional pay-off to their kiss in future installments, which made it a tad superfluous. Praise the heavens for DVD extras then, because, you have to admit, it was still pretty amazing seeing the twosome lock lips. Even if it has now been erased from history.